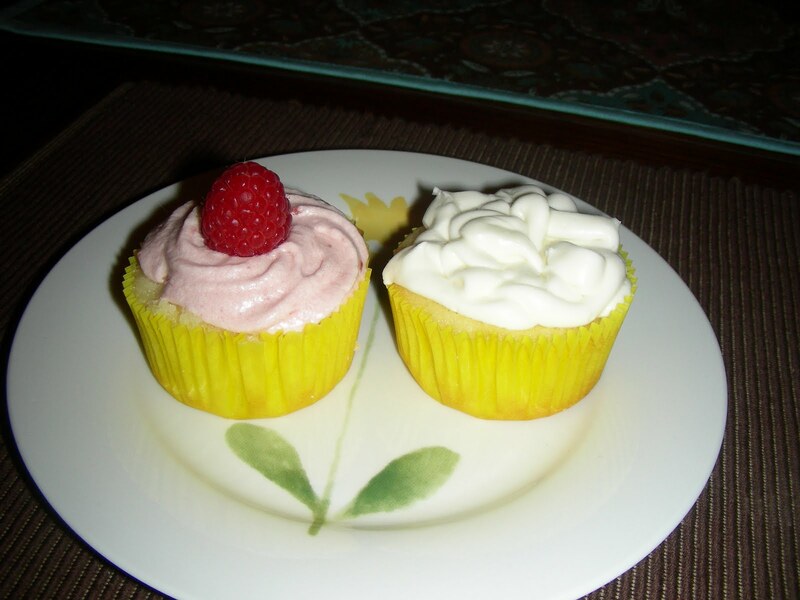 Baking and Cooking, A Tale of Two Loves: Lemon Cupcakes Two Ways! Preheat the oven to 350 degrees F and adjust a rack to the center position. Fill 2 cupcake pans with cupcake liners. Set aside. Sift together the cake flour, baking powder, and salt. Whisk the eggs with the whole milk or buttermilk. Put the sugar and lemon zest in a mixer bowl and rub them together with your fingers until the sugar feels moist and smells lemony. Using either the whisk or paddle attachment, add the butter to the sugar and beat at medium speed until the sugar and butter is fluffy and light, 3 full minutes. Beat in the lemon juice, then lower the speed and add one third of the flour mixture. If you continue to mix on medium you'll get flour poofing out. The add half of the milk-egg mixture, then beat in the rest of the dry ingredients, mix until incorporated. Finally add the rest of the milk-egg mixture and beat for a full 2 minutes on medium speed to insure that the batter is homogeneous and aerated. Divide the batter among the cupcake pan only filling 3/4 full. Bake for 20-25 minutes or until a toothpick inserted in the center of the cake comes out clean. Check early. Transfer the cupcakes to cooling racks and cool for 5 minutes, then remove them from the pans, and cool the cakes to room temperature. Beat butter with mixer until light and fluffy. Gradually add sugar, and lemon juice and beat until desired consistency. Oooh, I love the raspberry surprise in the middle. Both cupcakes look delicious. Thanks for passing the recipes along. 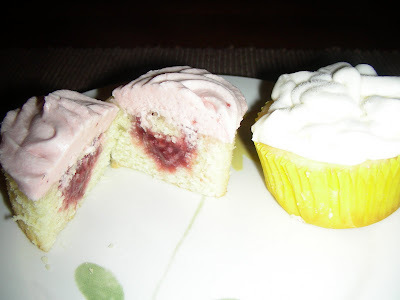 Hi Becky, I just love rasberry and lemon, my girls will love these too! Can't wait to hear more about you! Thanks for the b-day wishes! Love this combo! Looks absolutely delicious!